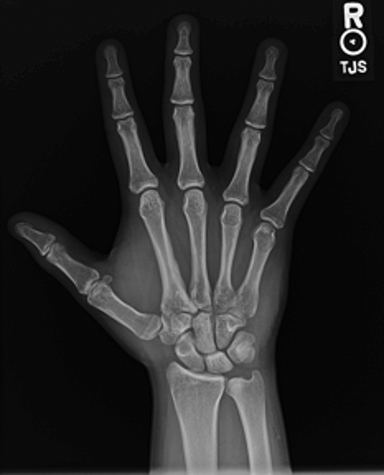 A healthy, 20-year-old, right-hand-dominant male presented to the hand clinic with a 10-month history of right-hand numbness and pain. The pain worsened at night and with activity, radiating to the first webspace and the fourth and fifth fingers. Opening doors, jars and using keys proved difficult. Ice provided no relief, and NSAIDs only mild improvement. On physical exam, the patient had tenderness over the first webspace and the right cubital tunnel. Tinel, Phalen, and Spurling signs were negative bilaterally. A flexion/compression test on the right was positive. Grip strength was 38 kg on the left and 18 kg on the right. Given the patient’s vague radiating pain, a presumptive diagnosis of cubital tunnel syndrome was made. Nerve conduction studies demonstrated no evidence of compressive neuropathy. 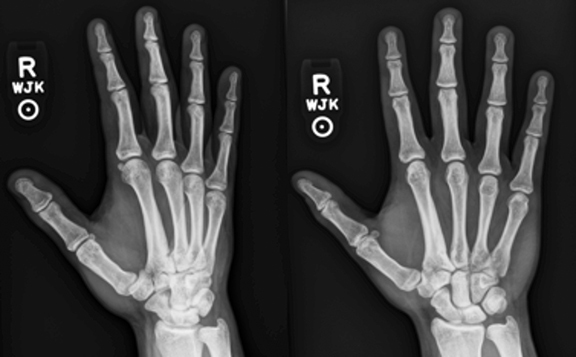 Hand radiography demonstrated cortical thickening along the second metacarpal shaft (Figure 1). Given the abnormal findings on his hand films, an MRI was ordered. 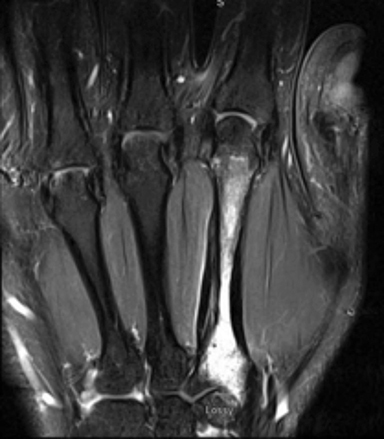 Magnetic resonance imaging (MRI) revealed a marrow abnormality of the second metacarpal with gadolinium enhancement (Figure 2). There was mature periosteal reaction and a high intensity split cortex along the ulnar margin. 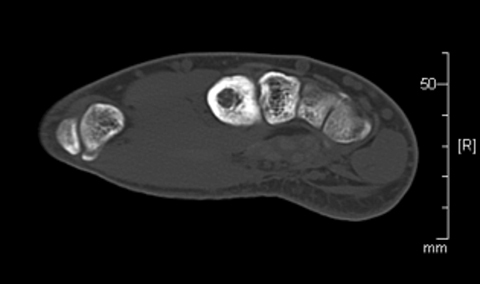 On axial T2 sequences, there was a small round dark lesion in the dorsal aspect of the proximal metacarpal, thought to be a nidus and consistent with a diagnosis of osteoid osteoma. As the patient continued to have pain in the first webspace and second metacarpal, he was referred to Interventional Radiology for treatment. Review of imaging findings suggested the nidus was likely near the base of the second metacarpal, accessible with a posterior approach. The risks and benefits of radiofrequency ablation (RFA) were discussed with the patient. Informed consent was obtained. The patient was placed supine on the CT scanner table, and sedated and intubated per anesthesia. Preliminary CT scan showed extensive cortical thickening and periosteal reaction along the ulnar side of the second metacarpal (Figure 3). A tiny lucent focus with a sclerotic rim was noted at the metacarpal base, presumably representing the nidus. After infiltration with local anesthetic, an 11-gauge On Control drill was advanced through the metacarpal base directly into the nidus (Figure 4). Next, a Covidian 17-gauge RFA antenna was passed through the 11G trocar. The trocar was retracted from the RFA antenna tip to avoid transmitting heat to the skin surface. Next, approximately 30 cc of D5 water was injected into the subcutaneous tissues, and a cold pack placed over the skin. A 6-minute ablation cycle at 90 degrees Celsius was performed, then the RFA antenna and trocar needle were removed. (Figure 5). On a follow-up call approximately 2 weeks post-procedure, the patient reported complete resolution of symptoms, and planned to resume all normal activity. At his 1-month clinic visit, he reported intermittent pain in his right hand only associated with certain activities, managed with acetaminophen or aspirin. Plain film radiograph demonstrated cortical defect from the procedure and unchanged thickening of the second metacarpal shaft (Figure 6). Modification of activities and a brace were recommended. The patient was called at 8 weeks’ and again at 20 months’ post-procedure. He reported complete resolution of symptoms and no physical limitations. In this case report, we describe our procedure for performing RFA of a metacarpal osteoid osteoma without damage to adjacent tissues. The most critical step in preventing complications is confirming exact placement of the antenna tip. In our case, the nidus was centrally located, allowing for protection of surrounding soft tissue by the cortical bone. Retraction of the trocar from the antenna tip is also crucial to prevent transmission of heat to the skin. As extra insurance against skin burning, we elected to utilize a previously reported technique of injecting nonionic fluid in the form of 5% dextrose into the subcutaneous tissue and covering with a cold pack.1 We believe, with the combination of these techniques, RFA can be safely performed for many lesions of the hand and carpus. Some authors have suggested that osteoid osteomas in the hand are not candidates for RFA due to the risk of complications because of the close proximity to skin and nerves. However, in one case series of RFA treatment of osteoid osteomas, 6 patients had lesions involving the hand, three of them involving the metacarpals. 5 Three patients had residual or recurrent symptoms following the initial ablation treatment, but the location of the lesion was not provided.5 Two other case reports of successful treatment of osteoid osteoma in the proximal phalanx have been published.6,7 In one case report, RFA was used to treat recurrent osteoid osteoma in the proximal phalanx after inadequate surgical excision. This resulted in intensification of pain requiring repeat surgical intervention.8 To our knowledge, no detailed report of RFA treatment of osteoid osteoma in the metacarpals has been published. The RFA process results in coagulative necrosis of the tissue immediately surrounding the probe. 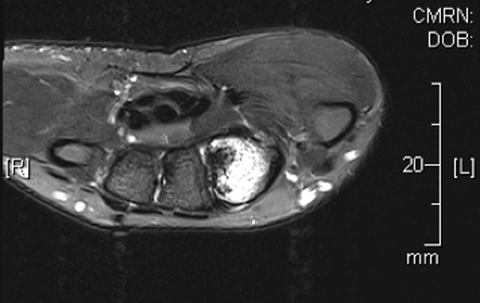 Ablations in bone benefit from the oven effect as the bone cortex traps heat within the medulla contributing to complete necrosis of the nidus in the case of osteoid osteoma. A standard safety procedure is to maintain a distance of 1cm from the probe to vital structures such as nerves, blood vessels and skin. In the hand, it is often not possible to maintain this distance, so surgical resection is often the preferred treatment.2 However, by using the procedures described above, it may be possible to safely perform RFA for hand osteoid osteomas. 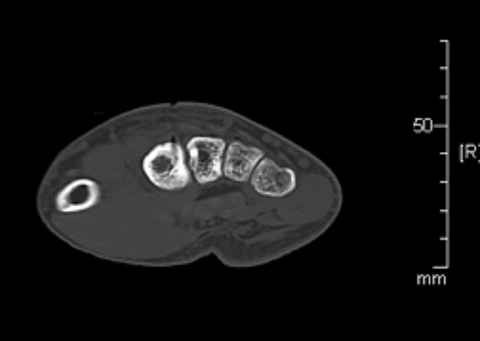 This case report demonstrates the feasibility of RFA of osteoid osteomas in the hand. Extra care is required to avoid excessive thermal heating of the overlying nerves and skin. Retraction of the trocar prior to the ablation cycle is crucial to prevent transmission of heat to the skin. Additionally, covering the overlying skin with a cold pack can help prevent thermal injury to the soft tissues. Rosenthal D, Callstrom MR. Critical review and state of the art in interventional oncology: benign and metastatic disease involving bone. Radiology. 2012; 262: 765–80. Natali GL, Paolantonio G, Fruhwirth R, Alvaro G, Parapatt GK, Toma’ P, et al. Paediatric musculoskeletal interventional radiology. Br J Radiol. 2016; 89: 20150369. Athanasian E. Bone and soft tissue tumors. In Green DP, Hotchkiss RN, Pederson WC, Wolfe SW, eds. Green’s operative hand surgery. Philadelphia: Elsevier Mosby. 2017:1987-2035. Rosenthal D, Hornicek F, Wolfe M, Jennings L, Gebhardt M, Mankin H. Percutaneous radiofrequency coagulation of osteoid osteoma compared with operative treatment. J Bone Joint Surg Am. 1998, 80 (6) 815-821. Vanderschueren GM, Taminiau AH, Obermann WR, Bloem JL. 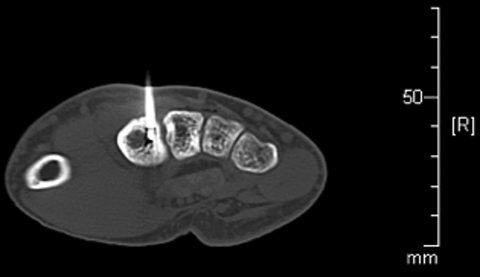 Osteoid osteoma: clinical results with thermocoagula-tion. Radiology. 2002; 224:82–86. Ramos L, Santos JA, Santos G, Guiral J. Radiofrequency ablation in osteoid osteoma of the finger. J Hand Surg Am. 2005; 30(4):798–802. Ozbek O, Nayman A, Koc O, Kucukapan A, Ozbek S, Kerimoglu U. Radiofrequency ablation of phalangeal osteoid osteoma: technical challenges encountered in small bones. Joint Diseases & Related Surgery. 2011. 22(2):107-109. Harrod C, Boykin R, Jupiter J. Pain and swelling after radiofrequency treatment of proximal phalanx osteoid osteoma: case report. J Hand Surg-Am. 2010. 35(6):990-994. Bailey R, Siesener NJ, Davis RM, Brogan DM. Radiofrequency ablation of an osteoid osteoma of the metacarpal. Appl Radiol. 2019;48(1):45-47. Prepared by Dr. Bailey while a Radiologist at the Mayo Clinic, Jacksonville, FL; Mr. Siesener while a Medical Student at the University of Missouri School of Medicine, Columbia, MO; Dr. Davis while Division Director of Interventional Radiology at the University of Missouri, Columbia, MO; and Dr. Brogan while an Orthopedic Surgeon at Washington University, St. Louis, MO.